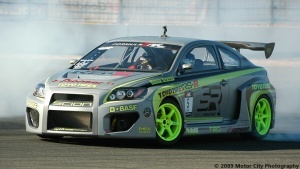 I was sitting in the Photo Room at Infineon Raceway, on the Thursday before the IRL race when one of the other shooters asked if I had heard about the drift competition that was going to take place at Turn 7 that weekend. I thought there might be a story in it and decided to see firsthand what the buzz was about. I overheard someone say there was a Scion with a “Phase 9” NASCAR spec Tundra engine…a Scion?, another car had a supercharged V-8 and yet another a twin turbo V-6. Little did I know I would get more than I bargained for. I drove up to the drag strip runoff and met with Formula Drift (www.formulad.com) PR man, John Pangilinan, who issued a set of photo credentials and vests to SMM for the event that was scheduled to begin on Friday, immediately after the IndyCar guys (and gal) had called it a day. He added that there was a must attend safety meeting that evening and now I understand why he made it sound so important. Now for those of you who know nothing about drifting, it appears to consist mainly in stabbing the gas pedal, getting up to speed (real speed) turning the wheels to bring the rear end out into a slide or drift over a specified course, while you do your best to control and manipulate the laws of physics. You’re judged on speed, angle, line and style. Pretty simple eh? Wrong! 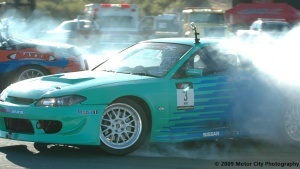 In Japan, drifting has been popular amongst street racers for over 20 years, at its peak developing into one of that country’s most attended professional auto sports. Its “fringe” nature appealed to American auto enthusiasts in the late 80’s and early 90’s, in particular the practice of drifting along winding mountain passes and canyon roads. I wasn’t prepared for what I saw. Sure, most motor heads have seen drifting on TV but nothing can prepare you for the unbridled mayhem, the energy, the color, the noise, the smoke and the excitement of cars sliding twenty feet in front of you traveling at speeds of up to 95 mph while you stand jockeying for shots amongst fifteen other photographers sequestered in a little concrete photo fort on the edge of the track that consisted of six k-wall sections arranged into a three sided square. There were times when I thought I had made a mistake going out there in the first place but once you were there, there was no turning back until the competition was over and the course was declared “cold” once again. After a short time of riding on the edge of sanity and better judgment, nothing could have made me leave and two evenings of breathing tire smoke just wasn’t enough. I loved it! Pangilinan said that interest the sport has been growing steadily in the U.S. and the future appears bright, based upon the increased number of entries, the availability of sponsorship and the number of devoted fans who attend their events. Bright indeed…the stands were packed in and around Turn 7 to see Stephen Verdier and his Subaru Impreza WRX STi celebrate their win. For more drifting images, visit the Press Democrat. Photography by J.R. Andres and Deborah A. Hepper. Author: John Andres /// submitted on January 10, 2010 - 9:33pm.